Climbing Guinea Flower ( Hibbertia scandens, DILLENIACEAE ). 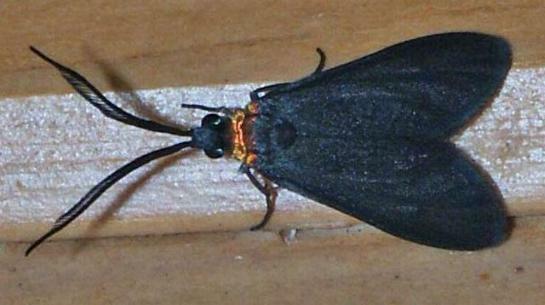 The adult moth is a metallic dark blue with a yellow thorax. 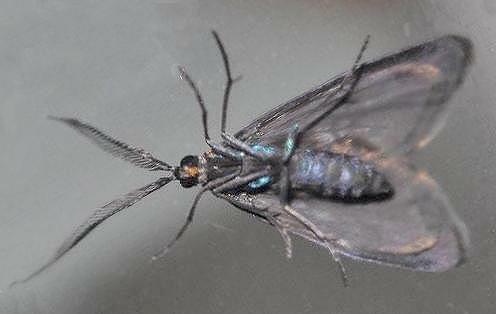 The moth has a wingspan of about 2 cms. 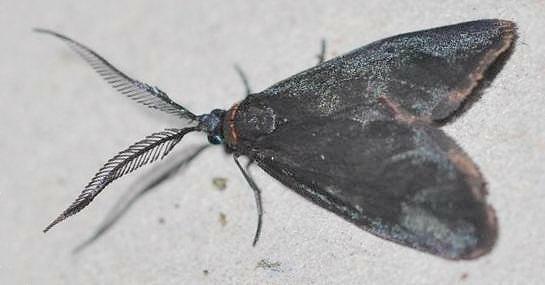 The male moths have been observed to have to have the ability to fold or unfold the sensilla on their antennae. The eggs are pale yellow and elliptical. They are laid in irregular arrays on a foodplant leaf, and covered sparsely in hairs from the abdomen of the female. Melbourne University Press, 1990, p. 297. Part 31, Supplement part 1 (1865), p. 62. CSIRO Publishing 2005, pp. 59, 66-67, 86-89, 91-96, 98-101, 128, pls. 13, 64.